Azerbaijan has been linked with oil for centuries, even for millennia. Medieval travelers to the region remarked on its abundant supply of oil, noting that this resource was an integral part of daily life there. By the 19th century, Azerbaijan was by far the frontrunner in the world's oil and gas industry. In 1846 - more than a decade before the Americans made their famous discovery of oil in Pennsylvania - Azerbaijan drilled its first oil well in Bibi-Heybat. By the beginning of the 20th century, Azerbaijan was producing more than half of the world's supply of oil. 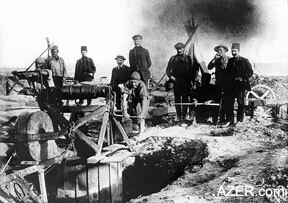 During its early Oil Boom, between 1885 and 1920, Azerbaijan benefited greatly from the expertise of well-known chemists and geologists from Europe and Russia. Baku's rich oil barons sought out the best advice that the scientific world had to offer, seeking recommendations from important figures like German chemist Carl Engler and Russian chemist Dmitry Mendeleyev. As a result, innovative new techniques such as rotary drilling and gaslift were tested for the first time in Azerbaijan. 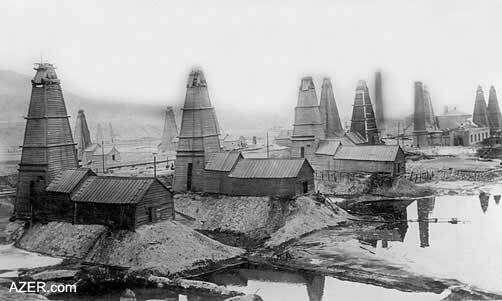 Above: The Nobel Brothers' oil wells in Balakhani, a suburb of Baku. The derricks were so close to each other, making the risk of fire eminent, and the noise level horrendous. Photo: Asbrink Collection. 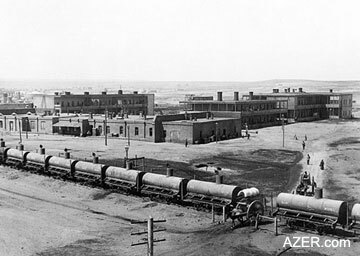 In 1920, when the Bolsheviks captured Azerbaijan, all private property - including oil wells and factories - was confiscated. After that, the Republic's entire oil industry was directed toward the purposes of the Soviet Union, including a tremendous output of oil for the World War II effort. Left: Hand-dug wells in Azerbaijan. 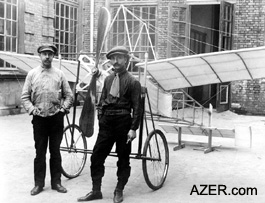 Right: Students of Baku Technical College (now the Oil Academy) standing beside the airplane they constructed in 1910. Photo: Azerbaijan National Archives. Here Azerbaijani chemistry professor Mir-Yusif Mir-Babayev identifies the milestones of Azerbaijan's rapid oil development up until 1920. Considering the progress that was made in leaps and bounds back then, one has to wonder: what would Azerbaijan's oil industry be like today if the Bolsheviks had not interrupted their momentum? Arabian traveler Baladzori (Al Belazuri Ahmad, died ca. 892) wrote that political and economic life on Absheron had long been connected with oil. Above: Oil wells in the vicinity of Baku pumping oil into reservoir lakes more than 100 years ago. The ecological disaster still plagues the region. Photo: Azerbaijan National Archives. Arabian historian Masudi-Abdul-Hussein (9th century-957) identified two main sources of black oil and white oil (kerosene) on Absheron. Arab historian Istahri-Abu Iskhak described how the people of Baku used soil soaked in oil as fuel. After visiting Absheron, Arab historian Muhammad Bekran wrote about the shaft extraction of oil in Balakhani (today, a suburb of Baku). 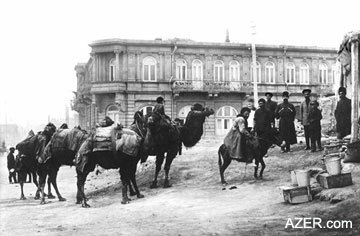 Right: Camel caravans in Baku late 1800s. Oil Baron Taghiyev imported the first car to Azerbaijan. By 1911, Baku had 11 cars. Photo: Azerbaijan National Archives. In "The Travels of Marco Polo," the world-famous Venetian traveler Marco Polo (1254-1324) indicated that oil from Baku was being exported to Near Eastern countries. He also described the use of oil as an unguent used in therapeutic healing. An inscription inside a well 35m deep in Balakhani indicated the date of construction and the name of the builder - Allah Yar Mammad Nuroghlu. German diplomat and traveler Adam Oleari (1603-1671) described Baku's 30 oil wells and said that oil gushed out of them with a mighty force. He identified both brown and white oil and wrote that there was a greater quantity of the brown. Turkish traveler Evliya Chelebi traveled to Baku to study and describe its oil fields. He noted that from olden times the political and economic life in this region had been closely connected with oil. Naturalist and traveler Engelbert Kaempfer (1651-1716), Secretary of the Embassy of Sweden to Persia, visited Baku and provided a detailed description of Absheron's oil resources. He wrote that oil was transported via wineskins on four-wheeled carts to Shamakhi and Baku. From Shamakhi it was taken across country on camels. From Baku it was taken by sea to the Uzbek and Cherkassy regions and to Dagestan. Above: Train ready for departure in Baku. Ludvig Nobel constructed the tank cars, and had them produced in Riga, Russia. Photo: Asbrink Collection. 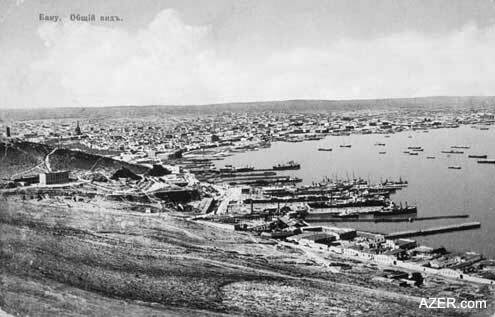 Above: Early view of Baku developing during the Oil Boom, late 1800s. View from Bibi-Heybat region. Photo: Azerbaijan National Archives. Physician Ioann Lerkh, employee of the Russian Embassy in Persia, visited Baku and described Absheron oil fields in detail, confirming that oil had been extracted in Baku since time immemorial. Based on materials from the famous hydrographer Fedor Soymonov (1692-1780), academician V.I. Veitbrecht published an article, "About Oil", which contained considerable information about oil on Absheron. The article was published in the scientific magazine "Notes on List" (in Russian "Primechaniya na Vedomosti") where he described the Absheron oil wells and provided a plan of the oil and gas fields. Ioanas Hanvei, Director of the English-Russian trade company, investigated the Baku oil fields and published his "Historic Essay on English Trade in the Caspian Sea" in 1754 in London. 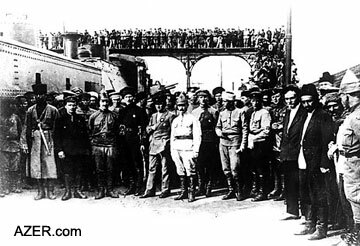 Above: The Red Army (with their armored train) entered Baku on April 27, 1920, demanding the resignation of the Azerbaijan Democratic Republic (ADR) Parliament and effectively ending Azerbaijan's control over its own oil resources. Most of the Oil Barons fled to Iran, Turkey or Europe. Photo: Azerbaijan National Archives. After visiting Baku, academician Samuel Gmelin confirmed that in Surakhani (today, a suburb of Baku) there was a substance known as "white oil" that was being distilled to produce kerosene. He also described the technique of well oil extraction. While heading an expedition to the Caspian, Russian Count Voynovich discovered oil and gas outcrops from the bottom of the sea near Chilov island. Gasimbey Mansurbeyov from Baku began to extract oil from two wells in the Bibi-Heybat Bay, at a distance of 18m and 30m offshore. In Balakhani, close to the Khalafi well, an inscription was found that read: "This well was rebuilt 200 years ago." Nikolay Voskoboynikov, Director of the Baku oil fields, invented a special distilling machine that produced kerosene from black and white oil. The first oil-distilling factory on the Absheron Peninsula began operating in Balakhani. At the suggestion of V.N. Semyonov, a member of the Caucasus Head Management, a 21m well was drilled in Bibi-Heybat for oil exploration. This event marked the first time in world history that an oil well was successfully drilled. More than a decade later, on August 27, 1859, "Colonel" Edwin L. Drake (1819-1880) struck oil on American soil for the first time, in Titusville, Pennsylvania. Vasily Kokarev, Peter Gubonin and German baron N.E. Tornow built the first factory in Surakhani, close to the Fire Worshippers' Temple. The factory was used to produce kerosene out of "kir", an asphalt-like substance. N.I. Vitte, a Tiflis [Tbilisi] pharmacist, built the second paraffin-producing factory on Pirallahi island. Javad Malikov built an oil-distilling factory in Baku for producing kerosene out of crude oil. Dmitry Mendeleyev (1834-1907), the chemist who developed the Periodic Table of Chemical Elements, visited Baku for the first time to work at Kokarev's factory (September 1863). Mendeleyev would visit Baku three more times - May 1880, May 1886 and August 1886. Azerbaijan's first reservoir for oil storage, stocktaking and release was built near Boyuk-Shor Lake. Vladimir Markovnikov (1838-1904) carried out major work investigating Absheron oil, resulting in the discovery of a new class of hydrocarbons called "naphthenes". He later received the Professor Pavel Ilyenkov Prize as well as a Gold Medal from the International Oil Congress for "Investigating the Oil of the Caucasus." In February, a new law was issued on "The Rules for Oil Fields and Excise from Photogen Production." The law put an end to the buy-out system in Azerbaijan's oil industry. The Haji Zeynalabdin Taghiyev Oil Trade Company was established. Taghiyev (1823-1924 or, perhaps, 1838-1924) was revered as the greatest philanthropist of all the oil barons in Baku. This year marked the beginning of oil well drilling on a massive scale. In July the first major oil gusher - Vermishevsky - erupted in Balakhani. Within three months, it had produced 90 million poods [1.5 billion kg] of oil. Robert Nobel, the eldest brother in the Nobel family, visited Absheron for the first time. The Artemyev brothers, merchants from Astrakhan (now part of Russia), organized the first marine transportation of oil from Baku to Astrakhan. 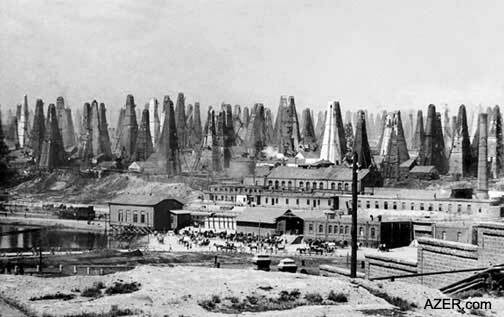 Baku's oil factory region began construction in what was, and still is, called "Gara Shahar" (Black City). Vasily Kokarev (1817-1889) and Peter Gubonin founded the Baku Oil Society Company. The Nobel brothers (Ludvig and Robert, with Alfred of Nobel Prize fame as a partner) started their activities in Azerbaijan's oil industry. Oil fields began to be developed in Absheron - specifically in Sabunchi, Zabrat and Romani (a name given by the Romans when they were in Sumgayit). Konon Lisenko, Chair of Chemistry for the St. Petersburg Mining Institute, visited Baku to study the reasons for the 1875 oil crisis that had taken place in the Russian Empire. In 1878, he published a monograph in St. Petersburg called "Oil Production, According to the Latest Data." The monograph was one of the first original oil-related publications ever written. Ludvig Nobel (1831-1888) moved from St. Petersburg to Baku. The Nobel brothers built the world's first oil-carrying steamship, naming it "Zoroaster" after Zoroaster (628-551 BC), a great religious reformer and the founder of Zoroastrianism, which predated Islam in the region. Oil pipeline construction was completed between the fields in Sabunchi and Black City. Bibi-Heybat had its first oil gusher. Vladimir Shukhov (1853-1939) supervised the project to build the first pipeline from Balakhani to the Black City. On March 24, the Baku Department of the Royal Russian Technical Society (in Russian - BO IRTO) was established. The Society played a key role in the development of Azerbaijan's oil business. On May 18, the Oil Production Fellowship of the Nobel Brothers established the Nobel Frere Petroleum Company. Balakhani's first power station, built by the Caucasus and Mercury Joint Stock Company, began operation. Alexander Letniy, a famous chemist and technologist as well as the discoverer and researcher of the process of pyrolysis, came to Baku. In 1880-1882 he designed and constructed the first major plant to produce benzene and anthracene from oil residuals via pyrolysis. The Nobel Brothers' factories started distilling oil on a 24-hour basis, based on an idea proposed by Dmitry Mendeleyev. English traveler and writer Charles Marvin visited Baku's oil fields. Between 1883 and 1886, he wrote "The Russians at Marv and Herat," "The Region of Eternal Fire," "Petroleum Region of the Caspian," "Baku is the Petroleum of Europe" and "Russia's Power of Attacking India." All of these books were dedicated to the development of the oil business in Absheron and the Transcaucasus. Construction of the Caucasus railroad was completed. This 514-verst (a verst is a Russian unit of distance that is equal to 1.067km) railway system connected Baku and Batum. On May 16 the Rothschild Brothers established the Caspian and Black Sea Oil Industry and Trade Society. Minister of State Property Michael Ostrovsky arrived in Baku in September accompanied by his brother, the famous playwright Alexander Ostrovsky (1818-1883), to discuss oil problems. Movsumbey Khanlarov was the first Azerbaijani to defend his Ph.D. thesis on chemistry at German Strasbourg University. Within a year, he returned to Baku and began working in the Baku Department of the Royal Russian Technical Society (in Russian - BO IRTO), according to Mendeleyev's recommendation. In Baku a special organization of entrepreneurs called the Council of Baku Oil Industrialists was established. The group was under the directorship of Ludvig Nobel until 1888. Sidor Shibayev founded the Shibayev Sidor Oil Industry fellowship. German chemist Carl Engler visited Baku to study the nature and origin of Absheron oils. For the first time in the history of the oil industry, engineer G.V. Alekseyev built a machine in Baku that produced kerosene by cracking petroleum asphalt. On January 11, Haji Zeynalabdin Taghiyev gave a speech at the Baku Department of the Royal Russian Technical Society (in Russian - BO IRTO) entitled "How to Get Out of the Oil Industry Crisis?" In it, he presented a clear plan for the export of Baku's kerosene. The report was so practical that it was printed and sent to all members of the society and oil manufacturers. In June, the Svet oil tanker transported Baku's kerosene from Baku to London via Batum for the first time in world history. Dmitry Mendeleyev's book "Baku Oil Industry in 1886" was published, summarizing the results of his oil-related investigations from the 1860s to 1886. Mendeleyev gave a speech at a meeting of the Baku Department of the Royal Russian Technical Society entitled: "About the Measures that Will Contribute to the Further Development of Baku's Oil Industry." In January a new publication called "The Works of BO IRTO" appeared. It was the first periodical covering issues related to the Russian oil industry in Baku. Several oil industry and trade companies were established, including the Oil Company belonging to Musa Naghiyev (1849-1919), the Caspian Fellowship and the Russian Standard. On December 8 and 9, Russian Czar Alexander III (1845-1894) was in Baku with his family. He visited the Nobel Brothers' factory in Baku's "Black City" (Gara Shahar in Azeri) and the oil industries of Rothschild's Caspian-Black Sea Society in Balakhani and Sabunchi. In St. Petersburg, a Russian Nobel Prize was established and named after Ludvig Nobel. The award was bestowed upon the individual who succeeded in doing the best investigative work in the field of metallurgy and oil industry. The prize, determined by IRTO, amounted to 1,200 gold rubles. Three awards were given - in 1896, 1898 and 1905. Chemist and engineer Konstantin Kharichkov (1865-1921) went to Baku to study the composition and chemical characteristics of Baku oils. Kharichkov wrote more than 100 original scientific works related to chemistry, the origins of oil and its processing. Oil industry organizations such as the oil company owned by Shamsi Asadullayev (1840-1913) and the Russian-Caucasian Oil Society were established. The Union of Baku Kerosene Producers was established in St. Petersburg to gain a monopoly over export trade. In March, engineer-technologist Alexey I. Stepanov became the first laureate of the Russian Ludvig Nobel Prize for his investigation of "The Basics of Lamp Burning." The oil industry and trade firms I.A. Akhverdov and Caucasus were established. The world's largest kerosene pipeline (829 verst, or 885 km, long) was built between Baku and Batum. The pipeline belonged to the Transcaucasus Railroad. The Rothschild brothers founded the Mazut Transportation Society. By 1912, it already had 13 large tankers in the Caspian Sea, plus other auxiliary ships. On January 10 a new biweekly publication called "The Oil Business" appeared. Two new oil and trade societies were founded: the Souchastniki (Collaborators) and the Absheron Oil Society. The Nobel Brothers Company, the largest oil company in Baku, extracted 93.2 million poods [1.5 billion kg] of oil, amounting to 17.7 percent of Russia's total production and 8.6 percent of the world's total oil extraction. Baku's oil industry ranked first in the world in terms of total oil extraction, with a total of 11.5 million tons a year. At the time, the United States was only producing 9.1 million tons. The Alexander Benkendorf Oil and Trade Company was established in Baku. The First International Nobel Prizes were awarded. The award grew to be revered internationally as the most prestigious award in the world and was established following the death of Alfred Nobel (1833-1896) via the execution of his will. Alfred's wealth was valued at 31 million Sweden crowns from his earnings from his invention of dynamite and from his holdings in stock - about 12 percent of the Nobel Brothers Petroleum Company in Baku. Swedish historian E. Brarbengren, who had access to the Nobel's family archives, insists that it was the decision to allow withdrawal of Alfred's money in Baku that was the "decisive factor that enabled the Nobel Prizes to be established." That first year, the Nobel Prizes were awarded to Germany's Wilhelm Conrad Roentgen (Physics), Holland's Jacobus Henricus van Hoff (Chemistry), Germany's Emil Adolf von Behring (Physiology or Medicine), France's Sully Prudhomme (Literature) and Switzerland's Jean Henri Dunant (Peace). Konstantin Kharichkov, Nikolay Zelinsky (1861-1953), Alexander Butlerov (1828-1886) and Movsumbey Khanlarov developed the industrial classification and methods for purifying Absheron oils. Konstantin Kharichkov published his fundamental work, "About the Composition and Chemical Characteristics of Russian Oil Deposits" (in Baku). In August the Nobel Brothers implemented the first transportation of Baku kerosene to Afghanistan. Geologist and oil specialist Dmitry Golubyatnikov began a systematic investigation of Absheron and predicted the availability of oil deposits in Surakhani. Konstantin Kharichkov published his monograph, "Cold Fractionation of Oil" (in Baku). The tankers "Vandal" and "Sarmat" were built under the direction of Immanuel Nobel (the son of Ludvig Nobel). In Baku, a Russian Nobel Prize was established and named after Immanuel Nobel. The prize was awarded for best works and inventions in the oil industry. The prize, determined by BO IRTO, was worth 1,000 gold rubles. Marking a first for the world's oil industry, the principles of oil compression were applied to the wells in Balakhani. The first "white oil" gusher appeared, in Surakhani. For the first time in Baku, the Nobel Brothers produced a high-quality Vaseline-type substance from Cheleken oil (both white and yellow). Baku petrochemist Victor Herr, Chair of the Chemical Lab at BO IRTO, became the first laureate of the Russian Emmanuel Nobel Prize. The Bibi-Heybat Bay was filled in with earth, a process that was completed in 1932 under the leadership of engineer Pavel Pototsky. This process was intended to make drilling for oil easier, since underwater drilling was not considered possible at that time. In Surakhani, engineer Von Gaber succeeded in completing the first well to use rotary drilling. The Mukhtarov Joint Stock Company was established in Baku. Ivan Gubkin (1871-1939), who later became known as the Founder of Oil Geology, began studying oil in Absheron. Toluene, which is similar to benzene, is produced due to military demands. Production was organized in three Baku factories - the "Neftegaz" Joint Stock Company, the Benkendorf and the Military Industry Committee. Professors Nikolay Zelinsky and S.A. Vishetravsky visited Baku and delivered speeches on "Toluene" and "The Practical Production of Benzene and Toluene from Oil and Coal." The process of gaslift was tested for the first time, as deep pumps were submerged in the Romani oil fields on Absheron. In March, pogroms against Azerbaijanis were carried out by Armenians and Bolsheviks in Baku. The Ismailiyya Palace was among the many buildings burned and destroyed during that rampage, which left an estimated 12,000 civilians dead. The Palace was built by Musa Naghiyev, who was acknowledged as the wealthiest of all Oil Barons in Baku. On April 28, Bolsheviks seized power in Baku. This led to the establishment of Soviet authority, which lasted for more than 70 years until December 1991, when Azerbaijan gained its independence. All private property was seized; most Oil Barons fled Baku for other countries; most of the lavish residences built by the Oil Barons in the center of the city were confiscated and converted into multiple apartments for multiple families. In May, the name of the journal "The Oil Business" was changed to "Azerbaijan Oil Industry." On November 14, the Baku Polytechnic Institute was established, becoming the first institute in Europe and Asia to train engineers in all fields of the oil industry. Later, it became known as the Azerbaijan Institute of Oil and Chemistry named after Mashadi Azizbeyov. After Azerbaijan gained its independence in 1991, the institute became known as the Azerbaijan State Oil Academy. "The Great Encyclopedia", 22 vols. (St. Petersburg, 1896). Startsev, G.D., "The Baku Oil Industry: A Historical Statistical Essay" (Baku: Aror Publishing House, 1901). Balayev, S.G., "Oil of the Country of Eternal Fire" (Baku: Azernashr Publishing House, 1969). "Monopolistic Capital in the Oil Industry of Russia in 1914-1917" (Leningrad, 1973). Nardova, V.A., "The Beginning of the Oil Industry Monopolization in Russia" (Leningrad, 1974). Dyakonova, I.A., "The Nobel Corporation in Russia" (Moscow, 1980). Mir-Babayev, M.F. and I.G. Fuchs, "The Nobel Brothers and Azerbaijan Oil (Dedicated to the 120th Anniversary of the Establishment of the Company)", Chemistry and Technology of Fuels and Oils 4 (Moscow, 1999): 51-53. Mir-Babayev, M.F., I.G. Fuchs and V.A. Matishev, "Foreign Capital in the Oil Industry of Russia (Absheron before 1917)", Science and Technology of Hydrocarbons 5 (Moscow, 2000): 75-80. Mir-Babayev, M.F., "The Prizes of the Nobel Family", Oil and Gas Chemistry 4 (Moscow, 2001): 42-46. ibid., "The Russian Technical Society and Development of the Oil Industry", Caspian Research 2 (2002): 80-83. ibid., "The Oil Business in Baku before 1917", Oil Industry N11 (Moscow, 2001): 98-101. ibid., "Baku Oil and the Rothschilds", Oil Industry N1 (Moscow, 2002): 93-95. Professor Mir-Yusif Mir-Babayev has a Doctorate in Chemical Sciences and serves as the General Chemistry Chair at Azerbaijan Technical University. His special interest is the early history of Azerbaijan's oil. Contact: M.F. Mir-Babayev: mirbabam@bp.com.